This article is about the Laura Ingalls Wilder novel. For the John Christopher novel, see The Long Winter (1962 novel). 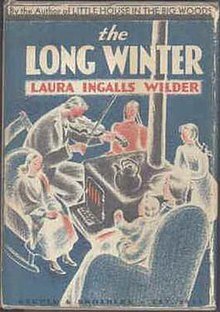 The Long Winter is a historical fiction children's novel written by Laura Ingalls Wilder and published in 1940, the sixth of nine books in her Little House series. It is set in southeastern Dakota Territory during the severe winter of 1880–1881, when she turned 14 years old. The novel was one runner-up for the Newbery Medal in 1941, as all the fourth to eighth Little House books were from 1938 to 1943. In retrospect they are called Newbery Honor Books. On a hot August day in the 1880s, at the Ingalls' homestead in Dakota Territory, Laura offers to help Pa stack hay to feed their stock in the winter. As they work, she notices a muskrat den in the nearby Big Slough. Upon inspecting it, Pa notes that its walls are the thickest he has ever seen, and fears it is a warning that the upcoming winter will be a very hard one. In mid-October, the Ingalls wake to an early blizzard howling around their poorly insulated claim shanty. Soon afterward, Pa receives another warning from an unexpected source: an old Native American man comes to the general store in town to warn the white settlers that hard winters come in seven-year cycles and the hardest comes at the end of the third cycle. The coming winter is that twenty-first winter, and there will be seven months of blizzards. Pa decides to move his family into his store building in town for the winter. In town, Laura attends school with her younger sister, Carrie, until the weather becomes too unpredictable to permit them to walk to and from the school building, and coal too scarce to keep it heated. Blizzard after blizzard sweeps through the town over the next few months. Food and fuel become scarce and expensive, as the town depends on the railroad to bring supplies but the frequent blizzards prevent trains from getting through. Eventually, the railroad company suspends all efforts to dig out the trains that are snowed in at Tracy, stranding the town until spring. With no more coal or wood, the Ingalls learn to use twisted hay for fuel. As the last of the town's meager food runs out, Laura's future husband, Almanzo Wilder, and his friend, Cap Garland, hear rumors that a settler raised wheat at a claim twenty miles from town. They risk their lives to bring sixty bushels of it to the starving townspeople – enough to last the rest of the winter. As predicted, the blizzards continue for seven months. Finally, the spring thaw comes and trains begin running again, bringing in much-needed supplies and the Ingalls' long-delayed Christmas barrel from Reverend Alden, containing clothes, presents, and a Christmas turkey. With the long winter finally over, they enjoy their long-delayed Christmas celebration in May. Wilder was a writer of historical fiction. Most of the people, places and events she describes are from her own life, but she sometimes juxtaposed events and compressed characters in the interest of good storytelling. This novel, however, is far less fictionalized than her others; it is, for the most part, an accurate description of that winter in De Smet. It runs from fall 1880 to spring 1881, a season of such frequent blizzards that it went down in history as "The Snow Winter". Accurate details in it include the names of the townspeople (with only minor exceptions), the blizzards' frequency and the deep cold, the Chicago and North Western Railway stopping trains until the spring thaw after the snow made the tracks impassable, the near-starvation of the townspeople, and the courage of Almanzo Wilder and Cap Garland, who ventured out on the open prairie in search of a cache of wheat that no one was even sure existed. The fictionalized material includes the "Indian warning" in an early chapter and the duration and frequency of blizzards. While historical records indicate a larger than usual number of blizzards that winter, Wilder's description of storms lasting on average three days each, with only two to two-and-a-half days separation, from late October until early April, would imply about 35 separate blizzards during that time frame, which may be dramatic license. Local oral history and research by Wilder's biographers also indicate that Almanzo and Cap traveled about 12 miles south of De Smet to find the wheat, not 20 as she states in the novel. Almanzo is portrayed as being roughly six years older than Wilder, when he was in fact ten years older. Aside from these minor variations, however, it is an accurate portrayal of that legendary winter in Dakota Territory. Wilder's editor for her Little House books was her daughter, Rose Wilder Lane, a well-known author and journalist and a prolific ghost writer. John E. Miller, in his biography Becoming Laura Ingalls Wilder, discusses extensive correspondence between Wilder and Lane during the editing process, and includes facsimiles of that correspondence. Virginia Kirkus had handled Wilder's debut novel Little House in the Big Woods for Harper & Brothers as its children's book editor from 1926 to 1932. In Kirkus Reviews, her semimonthly bulletin from 1933, she awarded this novel a starred review (as she did all of the 3rd to 6th Little House books). She advised, "Sell as true story material". The novel was the third of five Newbery Honor books for Wilder, recognizing books 4 to 8 in the series. In 2012, the novel was ranked number 84 among all-time children's novels in a survey published by School Library Journal, one of three Little House books in the Top 100. ^ a b c "The Long Winter" (first edition). Library of Congress Online Catalog (catalog.loc.gov). Retrieved 2015-09-18. ^ a b "The Long Winter"; Newly illustrated, uniform ed. LC Online Catalog. Retrieved 2015-09-18. ^ a b "The Long Winter" (starred review). Kirkus Reviews. June 15, 1940. Retrieved 2015-10-02. Online the review header shows a recent front cover, gives "volume 5" and "illustrated by Garth Williams". ^ a b "Newbery Medal and Honor Books, 1922–Present". Association for Library Service to Children. American Library Association (ALA.org). Retrieved 2015-09-21. ^ Bird, Elizabeth (July 7, 2012). "Top 100 Chapter Book Poll Results". A Fuse #8 Production. Blog. School Library Journal (blog.schoollibraryjournal.com). Retrieved 2015-10-26. This page was last edited on 27 March 2019, at 21:32 (UTC).